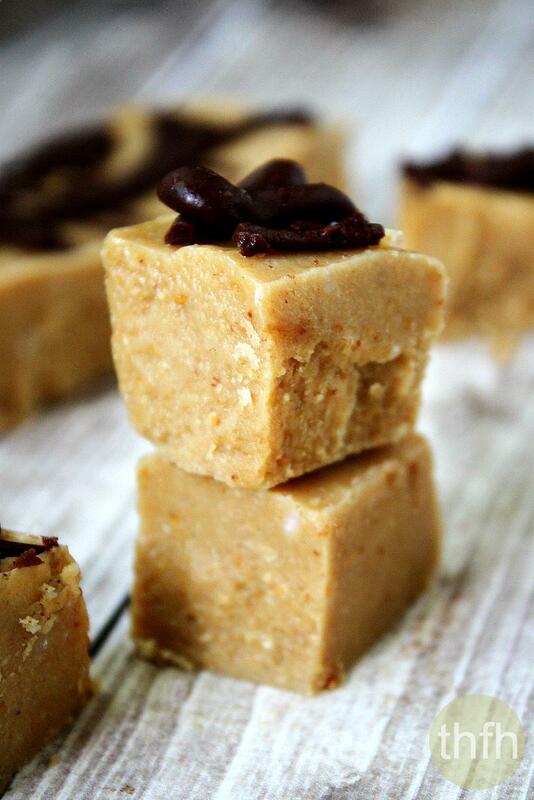 When you are looking for a simple peanut butter dessert, you can’t really get any easier than this Clean Eating Peanut Butter Fudge recipe. It’s made with only 4 clean ingredients and takes less than 5 minutes to prepare. The hardest part is waiting for it to harden in the freezer. That’s -a lot- of refined sugar and you have to heat it, boil it and mix it with a mixer to prepare it. This healthier version uses a natural sweetener, one bowl and about 5 minutes of your time. You can even dress it up with some raw cacao drizzle on top! And, it’s vegan, gluten-free, dairy-free and contains no refined sugar. Want more healthy dessert recipes? 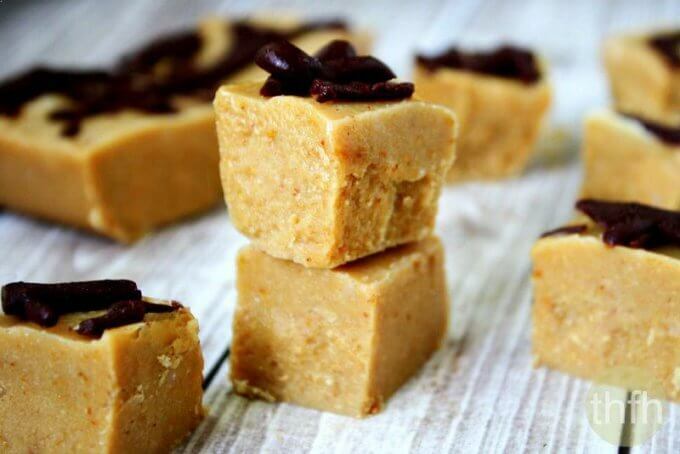 Check out Clean Eating Pumpkin and Pecan Fudge, Healthy Holiday Fudge, Chocolate Fudgesicles or my Clean Eating Cookbook with an entire chapter of 20 healthy, clean eating recipes just like this one that you will love! Step 1 Add all ingredients to a medium sized bowl and stir until well combined and smooth. Pour into a glass 9 x 5 bread loaf pan and put in the freezer for 1 - 2 hours, or until it hardens. Remove and let it sit on the counter top for about 5 - 10 minutes to slightly soften to cut and serve. Store in the freezer because it will get soft and lose its shape if left out at room temperature. This recipe will make approximately 16 small squares. The recipe and photographs for "Clean Eating Peanut Butter Fudge" by The Healthy Family and Home are licensed under a Creative Commons Attribution-NonCommercial 4.0 International License and cannot be used without my written permission. Could vanilla extract be used instead of the powder? I’ve never seen the powder. Hi there Teresa! Yes, you can definitely use vanilla extract! I just prefer to use the vanilla bean powder (especially in raw, uncooked recipes) because I find the alcohol flavor in the extract is too strong since it doesn’t evaporate out like it normally does in baked/cooked desserts. If you’ve never tried 100% pure vanilla bean powder…it’s ~amazing~!!! It’s a little pricey, but you only have to use 1/2 as much as vanilla extract because the flavor is so strong and it will last a good while. The rule of thumb is to use 1/2 vanilla bean powder than you would vanilla extract (example: 1/2 teaspoon vanilla bean powder = 1 teaspoon of vanilla extract). However, I love the flavor so much, I usually use equal amounts in my recipes (example: if I would normally use 1 teaspoon of vanilla extract, I usually will substitute with 1 teaspoon of vanilla bean powder). For this recipe, you could start with 1/8 teaspoon of vanilla extract and add an extra 1/8 teaspoon if you think it needs more. If I wanted to add cacao to make them chocolate peanut butter fudge, how much do u think would work. 1/4c ? Hi there Michelle! Yes, you can definitely add raw cacao to make it chocolate! I would add 1/4 cup.